Taking a break from filming the path of the elusive black cat through the Ashburton District countryside are tramper Nic Newman and Otago University postgraduate natural history film students Pip Walls and Mark Orton. The black cat that has stalked the countryside of the Ashburton District and haunted the imagination of trampers is about to be captured on film. 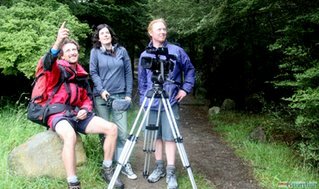 Two postgraduate natural history film students from Otago University are making the legendary “black panther” and its spotters the subject of their end-of-year film, a film they hope will attract wide interest around New Zealand. Prior to Christmas Pip Walls and Mark Orton spent several days roaming the hills with Alan Kircher, one of the panther spotters, and yesterday headed into the Mt Somers Track with Nic Newman, who saw the big cat in June last year. When the pair decided to base their film around the black cat sightings, they never imagined the public response would be so positive, Ms Walls said. “After we went to the media with what we were doing the response was huge. We’ve had loads of people call us and have loads to now get through. We had a fantastic public response, all of it positive. In all those calls we only got two hoax calls, and even they were great,” she said. Yesterday’s filming was the first of at least three in the district, where the crew will spend time on a farm property, at Lake Clearwater and on Winterslow Station. On each occasion they will film the people who spotted the “panther”, recording their tale as part of building up a complete picture of the cat and its travels. To provide another angle to the film, they hope to meet with Sceptics Society chair Vicki Hide. Orana Park will also be visited before the crew head south to Bendigo Station and Twizel. When they chose the mysterious cat as their film subject they never imagined it would become such a huge project or one that would attract so much public attention, Ms Walls said. The film will screen in Dunedin on June 9 and its makers hope there will be an opportunity for it to screen in the Ashburton District shortly after its premier. Those involved in the filming will be kept posted on progress and will be invited to the southern screening, she said.